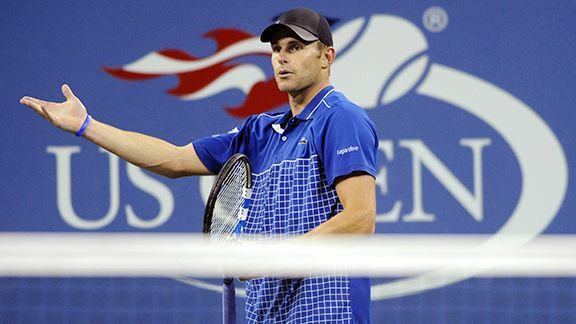 AP Photo/Henny Ray Abrams Andy Roddick was knocked out of the U.S. Open already but he still has his humor. Andy Roddick's run at the U.S. Open didn't last as long as Roddick and fans would have expected. But like many athletes these days, his off-court activities are just as exciting as his on-court. There's his super model wife, Brooklyn Decker. "I got the better half of that one," said Roddick at this year's BNP Paribas Taste of Tennis event in New York City. There's his guest appearance on Terrell Owen's reality show, The T.O. Show (Season 2, Episode 7, for curious viewers), filmed when Owens visited him at the Miami Masters. Owens laments on the show how he's bummed Roddick can't party with him now that he's settled down. "That was the funny thing when I was watching it," Roddick said. "I'll still go out with him!" 1. Retweet @darrenrovell1 Aug 23, 2010: Why does Tiger Woods' signature all of sudden look like it says "Single Dude"? Roddick's explanation: "There's really no explanation for that. I just saw it, and I thought it was pretty funny." I love my family. That is freaking hilarious. Roddick's explanation: "Uncle Kelly, who is one of the greatest guys in the world, was nice enough to come out and support me during the tournament. I guess one time he gets pretty rowdy during one of the matches and he kind of put his arms up in celebration and completely knocked a beer out of someone's hands as they were walking by and it kind of hit someone in the face with a beer. Supposedly it was a little bit of a misunderstanding, but he went outside and sat in the car and my aunt Paula watched the last 15 minutes of the match." 3. Retweet @shanebacon Aug 3, 2010: Well, if it makes you feel any better, Sarah Palin has 211,000 followers, and there is no way they all like her. Roddick's explanation: "I was getting kinda razzed by someone. These are all re-tweets. I didn't even write most of these. A lot of times, on top of writing stuff myself, if anybody writes something humorous, I like reading them too. I guess I just have the platform to share." Roddick's explanation: "Any time you can interject Kanye and talk about how someone was the best of all time, I thought it was pretty funny." 5. Retweet @lovingonCR July 8, 2010: Team Jacob. Everybody knows. No need for a press conference. Roddick's explanation: "The Twilight fans? You can't mess with them. You can't joke about anything. I thought that was pretty funny so I threw it out there. I got some vicious responses. They're really into it. Oh my Lord! They just get real serious and like offended that you're on one of the vampires versus the other one or werewolf or whatever. It was pretty funny. There was a little bit of backlash." Laura Lane is a contributor to Page 2 and ESPN The Magazine. She is also a host of the "ESPN Inside Deal" video magazine.